My kids love when we go to a fancy brunch and they have a waffle bar where they can add all the ingredients they desire. Personally I never thought to replicate a waffle bar at my own house. 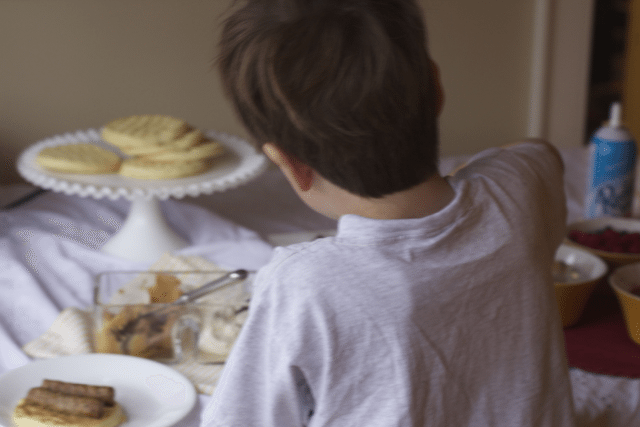 Let’s face it moms, who wants to sit over a waffle iron and make waffles for all the guests. Until one morning, I looked into my freezer and saw the numerous boxes of Eggo Waffles that I keep on hand for a quick weekday breakfast. We normally eat the Nutri Grain Blueberry Eggo Waffles, but I found a family pack of Buttermilk Waffles at Walmart and realized I can replicate a waffle bar with the ease of Eggo Waffles. 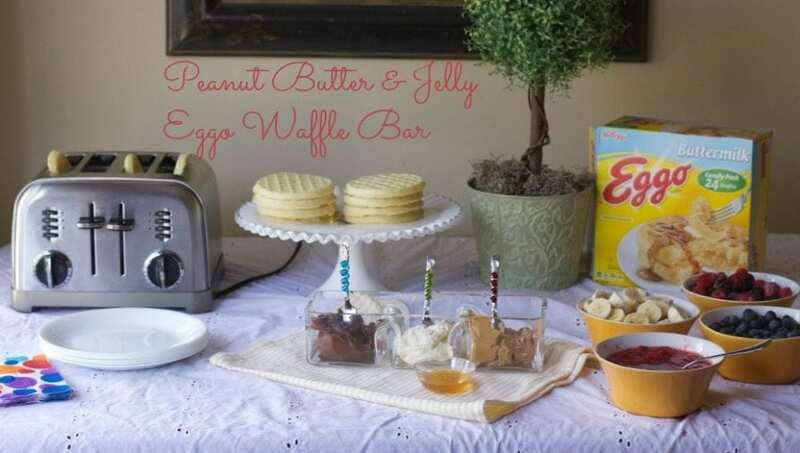 Instead of all the candy and sugar you might find at a restaurant Waffle Bar, I decided to make even more special with the theme of a Peanut Butter & Jelly Eggo Waffle Bar. 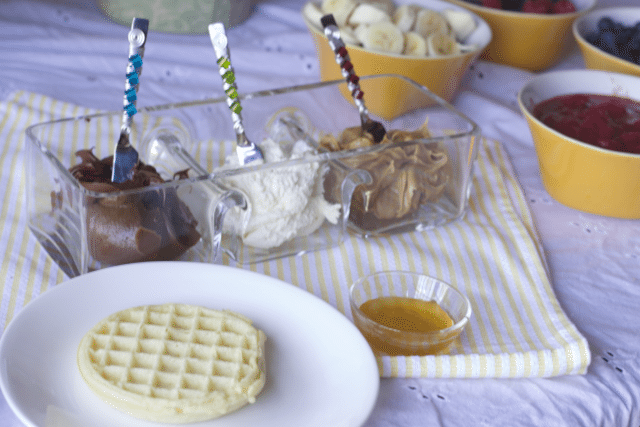 Surprise your breakfast guests with this super easy, self serve Waffle Bar that the parents can sit back with a cup of coffee and let the kids fill their plates with a hearty Eggo Waffle Breakfast. While it might seem a little unusual, peanut butter and jelly tastes amazing on a waffle. I set up 3 spreadable toppings, peanut butter, chocolate nut spread and plain cream cheese for those not into the peanut butter idea. Instead of sugar filled jams and jellies, I decided to provide bowls of fresh fruit such as blueberries, mixed berries, strawberries macerated in sugar and of course bananas. I love banana and peanut butter sandwiches. Fresh fruit might get expensive depending on the time of year, so pick up some frozen fruit. Top it all off with a little honey, whipped cream and a few sprinkles to make it fun for the kids. I forgot to put out powdered sugar but all kids and adults like the extra dusting. Our Waffle bar was a success and the kids got right into it. If you don’t want to have a toaster on the bar if you have younger kids, you can heat several waffles at once in the oven. 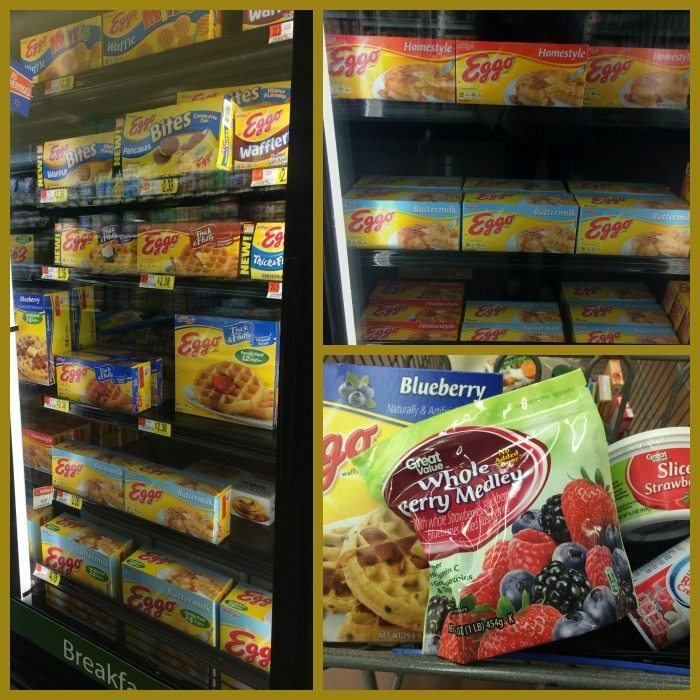 You can find all the ingredients needed for this yummy peanut butter and jelly Eggo Waffle Bar at your local Walmart stores. 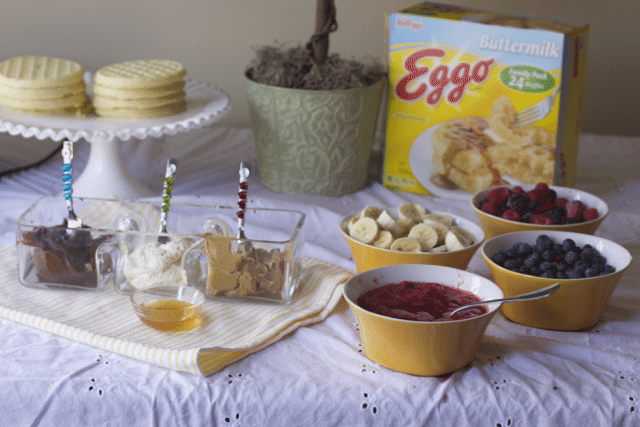 What would you add to your Eggo Waffle Bar? Cute! great for a party! I totally need to make peanut butter and banana waffles! YUM! And now I have this song in my head – Peanut Butter Jelly Time!! Yum! I love this idea and my kids would get a kick out of it too! What a creative idea! I love the mix of flavors! My kids would love this! I’ll have to surprise them one weekend morning. 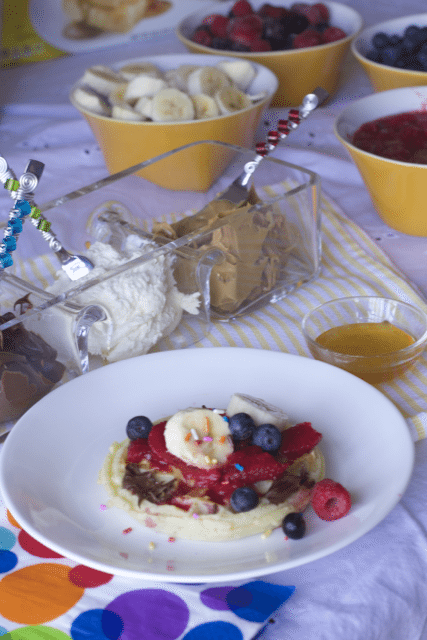 The kids would love it if I made a waffle bar – this it such a fun breakfast. Now that’s a great bar right there to have made up for the kiddos. Everyone in the house loves a goo Eggo. These would make a great snack for everyone! It’s a wonderful recipe! These look absolutely delicious! And I bet the kids love them! Yep, you got me hooked! Eggos, peanut butter and jelly? Yes, please! This is such a great idea and I know that the folks around me would really love to do the same thing at my house..
Almond butter and jelly is my favorite waffle topping! We also really love chicken and gravy on our waffles. Oh what a good idea. This is such a fun way to have Eggos! A waffle bar sounds so fun and delicious! My kids would love it. I love this idea for when you have several kids sleeping over! How fun for them and easy for mom!! Maybe add some chocolate syrup? I absolutely LOVE this idea! We do a lot of brunch entertaining, so this will be perfect! What a fun way to make a hearty, nutritous breakfast. Great idea! Oh my this looks yummy. This is a n awesome idea for my son’s 15 th birthday. This is such a fun idea! And I love your vintage-looking toaster! 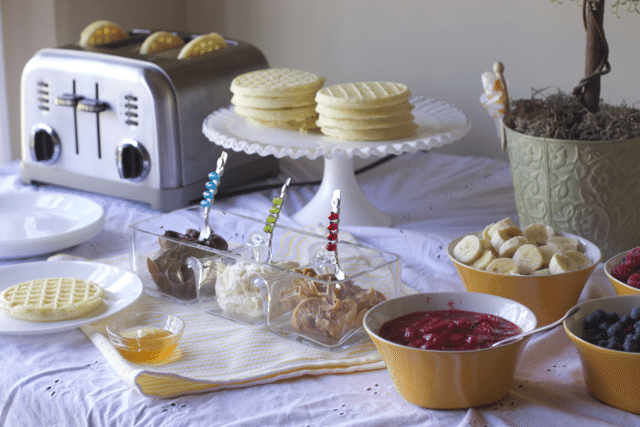 Love the idea of a waffle bar! How cute and easy for kids. Now that is a breakfast I want to be invited too! My kids wold love a waffle bar! This is something I’d do with my family or even some friends. I love having a main food and lot’s of options. Your breakfast bar looks yummy. I never thought about making a Waffle Bar for everyone to put on their own toppings, but I like that I can make this and try it out! Thanks for the idea and we will be doing this soon! That would be a HUGE hit in my house. My kids love stuff like this.